This 6-part condensed set includes preprinted Employer W-2 Copy A (federal, red scannable), Copy D (file) and Copy 1 (state) forms in a 2-up format. 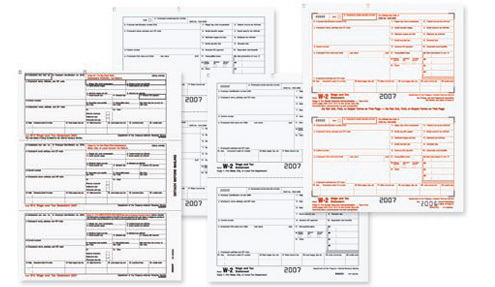 Employee Copies B (federal), C (file) and 2 (state) are preprinted on one 3-up perforated sheet. All 81/2" x 11" sheets are constructed of 20#. The employer 2-up forms are printed with no side perforation and the 3-up employee forms have a ?? side perforation. Print each copy as a batch, then fold and mail recipient copies. No collating or separating needed! Order the quantity equal to the number of employees for which you need to file, you?ll get all necessary forms. Mail employer copies in a batch to the SSA and state. Mail employee copies in envelope #3UPDWENV05. Rush next business day shipping available for some products - $25.00. Must be placed by 2PM Eastern. Does not include expedited shipping.